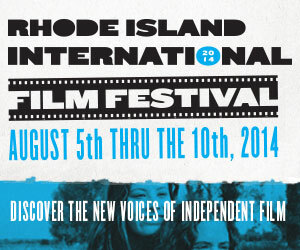 Now in its 18th year, New England's largest and most prestigious festival — FLICKERS: Rhode Island International Film Festival™ (RIIFF) — will take place August 5-10, 2014. Ranked as a one of the Top 12 Film Festivals in the United States, this world-class event will be held at venues around Providence. It features screenings, filmmaking workshops, meet-and-greet industry events and seminars. Aiming to promote Rhode Island as a filmmaking location and to celebrate the independent filmmaking spirit, FLICKERS also hosts a number of high-profile premières and provides a showcase for international features, documentaries, and shorts. This year, FLICKERS will screen amazing new work selected from over 5,100 film submissions. 100% of the RIIFF schedule is created from these film submissions; and not culled from other festivals. This makes for a truly dynamic event where regional audiences discover new work and new filmmakers whose work often overlooked.